It’s kinda safe to say that everyone loves Boho decorating style which is the short word to define Bohemian. 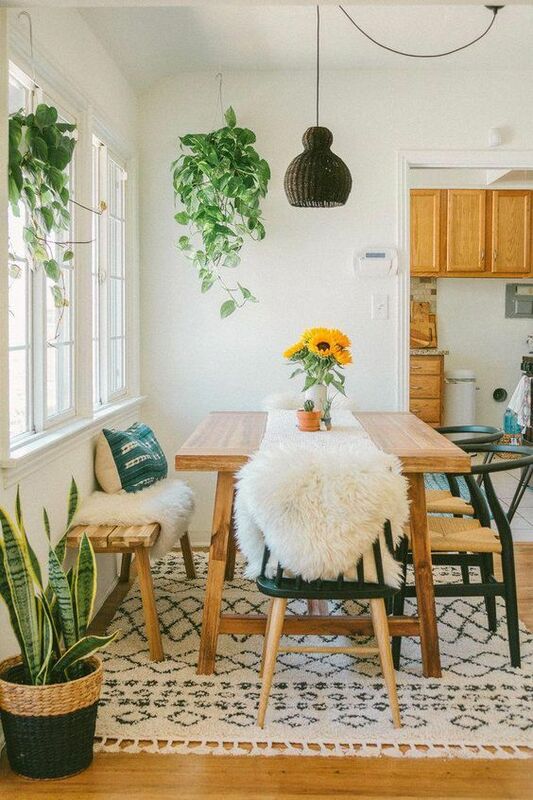 Many homeowners choose Boho decor to style up their home due to its own uniqueness. The uniqueness of Boho about combining various kinds of statements in one decor. You can add tons of colors, pattern inside a room with Boho decorating style. 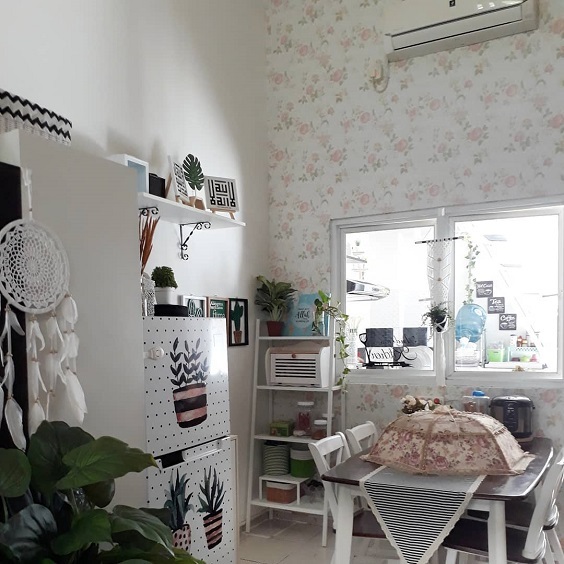 Therefore, it’s also characterized as eclectic decor in which you will find that each room with Boho decor will not have the same overall look. There is almost no limit in styling up a room with Boho decor. You can use your own imagination and play with your favorite object create a chic Boho decor. 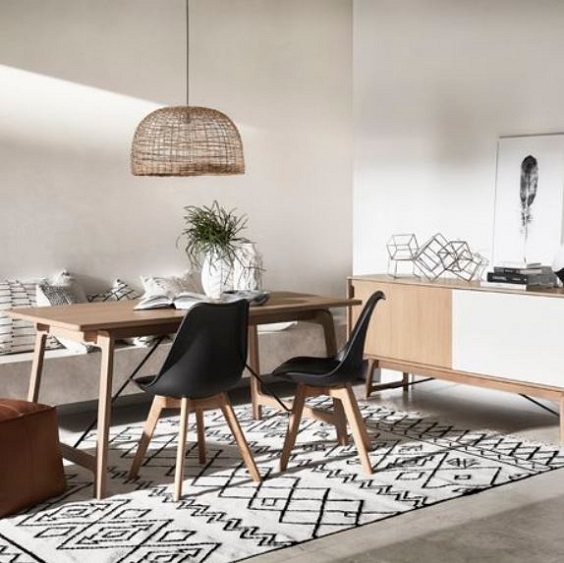 But still, you have to properly combine all the elements of the room so you won’t end up having the one with an uninviting look and atmosphere. Therefore, Boho decor is always a good option when you have a plan to decorate your home. It will make your place look so attractive in a very distinctive way. 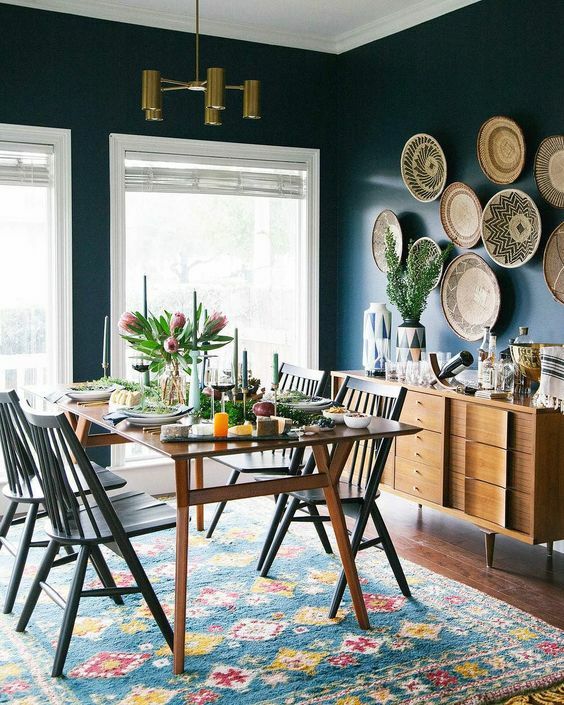 Bringing Boho decor to your dining room is definitely a very great idea. You can enjoy a more exhilarating dining experience with the combination of culture and style of the Boho decorating style. For your inspiration, we have picked dozens of gorgeous Boho dining room ideas which will totally inspire you. They are so worth to be an ultimate reference to create a unique dining room decor. So, let’s just keep scrolling to check out our best picks of Boho dining room ideas! 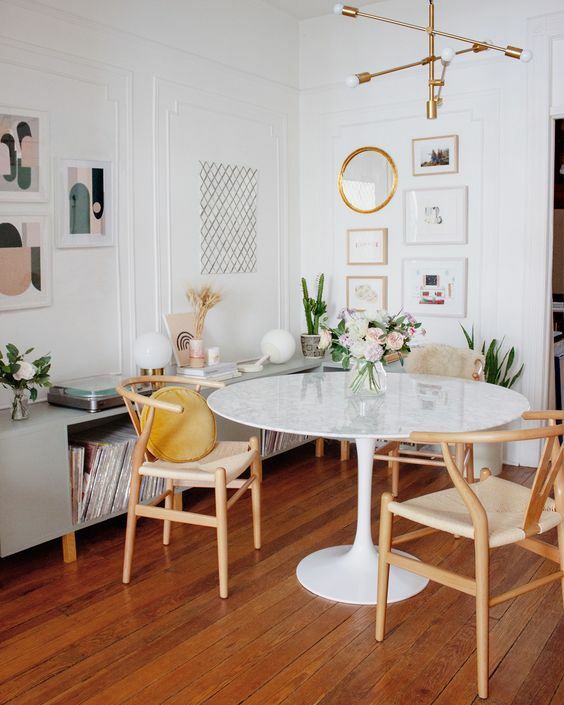 For you who love a more girly decor, this Boho dining room can be a good idea to steal. 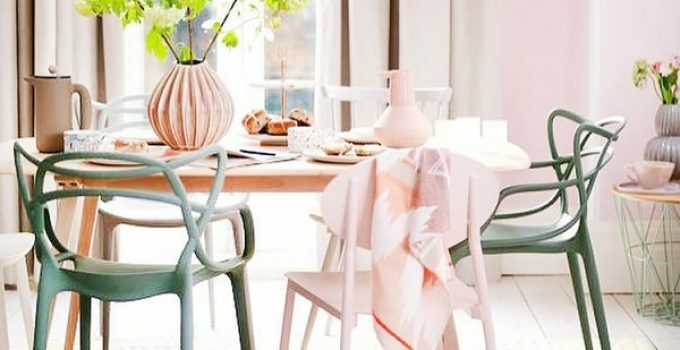 Soft pink colorizes the whole room which matches gorgeously with the dining chair in similar finish and those wood tones. Then, the green chairs and lighting fixture add another color alongside those indoor plants in a very beautiful way. 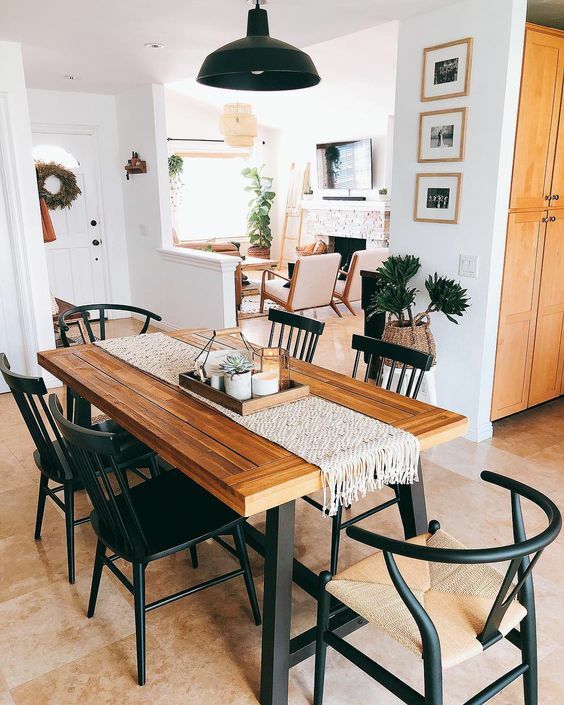 A unique dining set which consists of one round table, two chairs, and one L-shapes bench becomes a chic focal point in this Boho dining room. 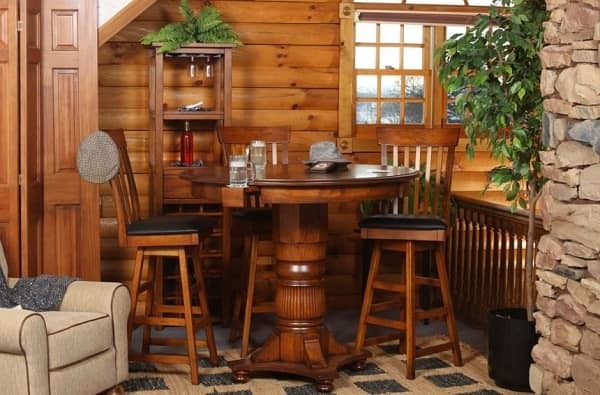 The raw rustic style of the set’s design matches attractively with the wood flooring. Moreover, some toss pillows with ethnic print emphasizes the Boho vibe around the room. A chic Boho dining room with the rustic earthy vibe that everyone will love. 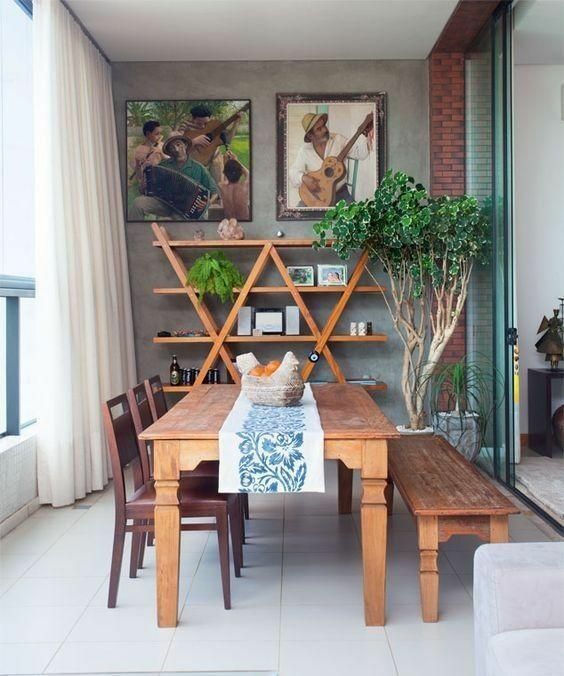 The dining set in wood look and some indoor plants dominate the decor stylishly. To make it look more attractive, an ethnic rug then completes the decor. 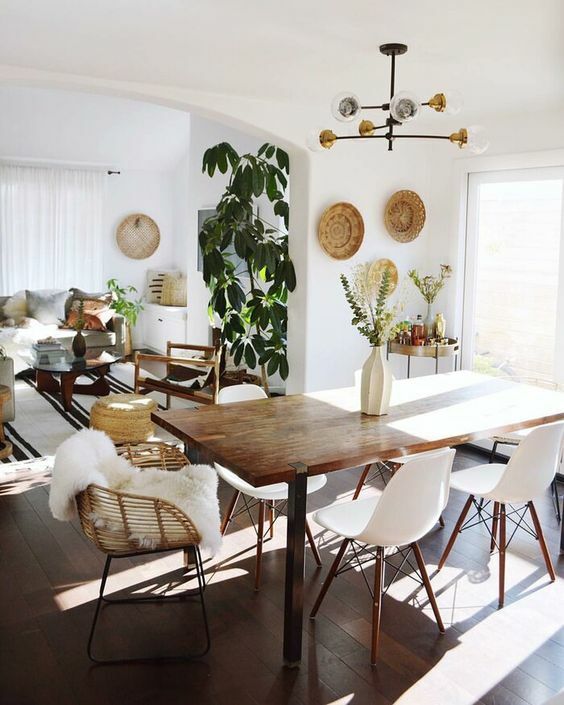 This Boho dining room is filled with tons of earthy elements like its rustic dining set, jute rug, and indoor plants. A velvet green bench with gold steel legs then adds another style which enhance the beauty of the decor in a very distinctive way. Thanks to its all-white background color which neutralize the warm hue of the room’s decor. Since Boho decorating style is considered as an eclectic one, you can add various kinds of elements as you wish to your dining room. 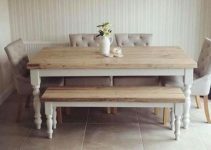 Here, the rustic table and bench are matches with the modern chairs in various designs which then become a distinctively attractive focal point of the room. Moreover, various kinds of indoor plants then decorate the rest of the decor. If you prefer a more simple Boho dining room, then this idea should be on your top list. The room is colorized in white which creates a simple bright overall look. Then, a modern rustic dining set and chevron rug is used as the focal point. Some dining wall arts give a more decorative touch attractively. 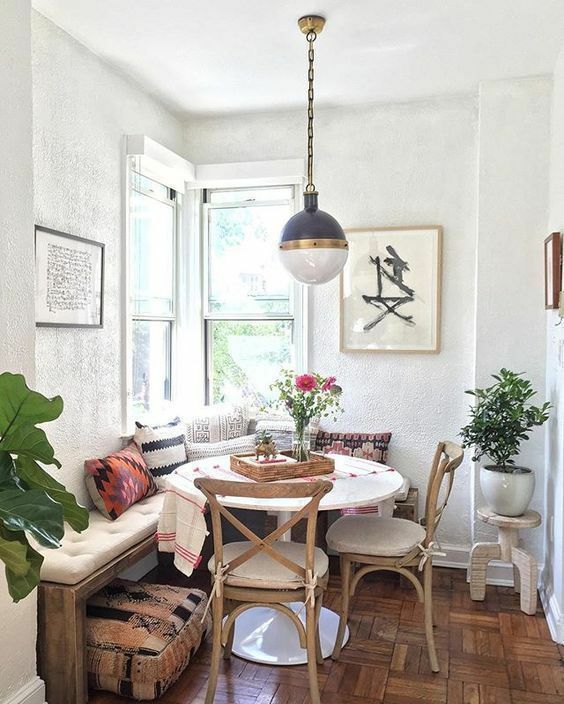 This Boho dining room looks so catchy with the bright wood tones which dominate its decor. The grey background color of the room perfectly let those vibrant earthy finishes pop up strikingly. 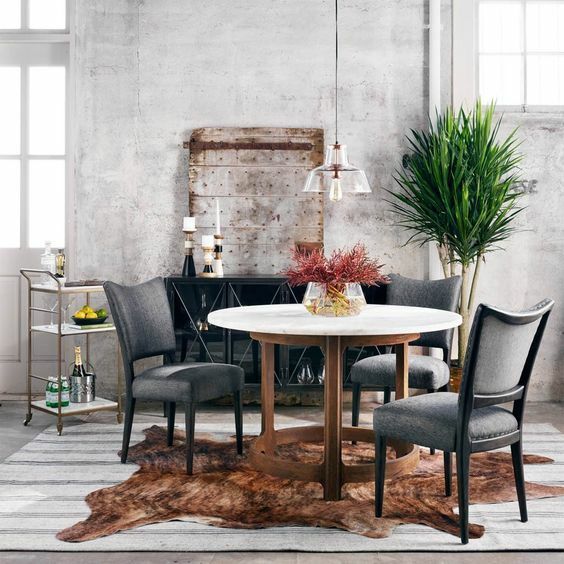 The dining set in natural wood finish with distressed texture, indoor plants, concrete wall, and exposed brick accent in this Boho dining room creates a gorgeous rustic overall look. A big window is installed which lets the sunlight to brighten up the room and make it feel more airy. 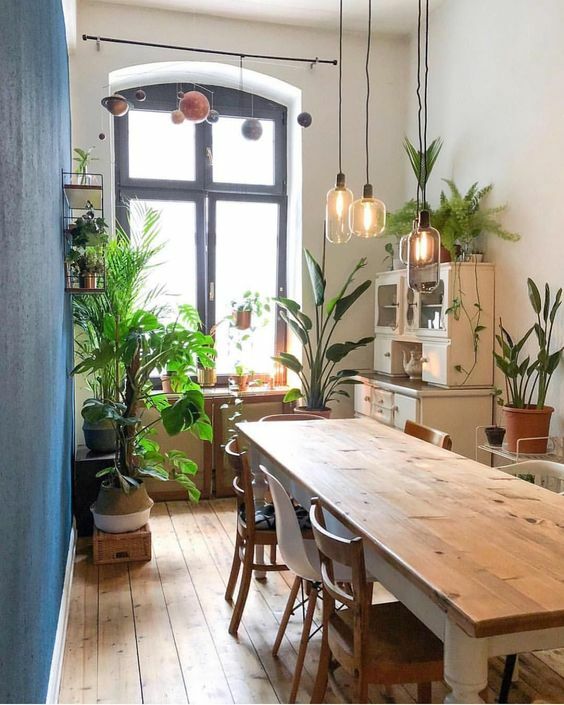 Tons of indoor plants fill this Boho dining room, creating a beautiful indoor garden which will make your dining time feel way more exhilarating. The vintage furniture in natural wood finish complements those plants in a very stylish way. A gorgeous dining set which consists of a rectangular, L-shaped cushioned sectional, and a square ottoman is made as the focal point in this Boho dining room. The set gives a nice minimalist style in a more rustic look which makes it look so tempting to have. To add a more Boho vibe, ethnic rug then completes the decor. The combination of white and wood tone seems to become everyone’s favorite when it comes to Boho decorating style. Here, white is used as the background color and wood tones dominate the decor, creating a fabulous rustic nuance. The room feels so airy with its big window and some indoor plants. 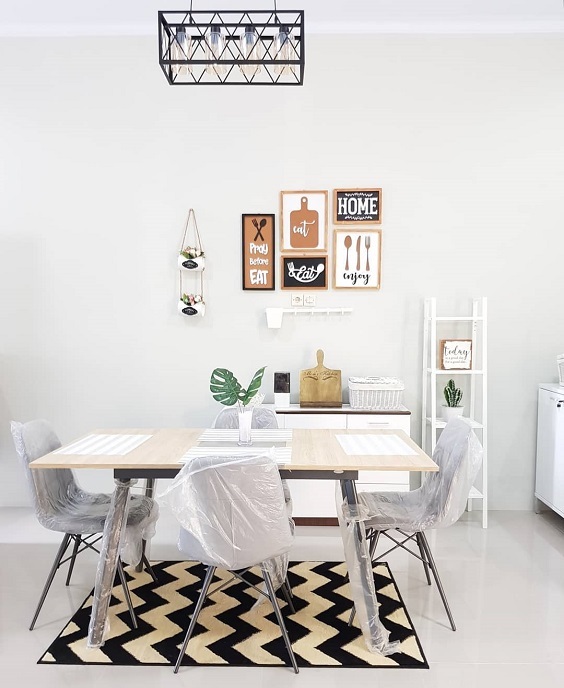 The white wall with gorgeous detail of this Boho dining room creates a chic decorative overall look in a very simple way. 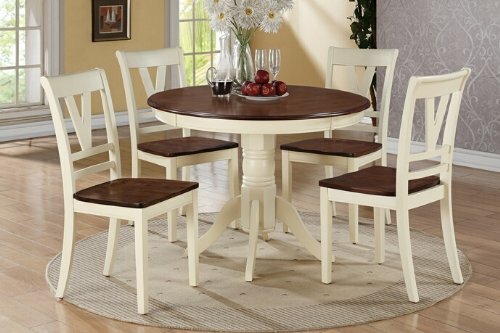 A 4-piece dining set which includes 3 wood dining chairs and sleek round dining table with marble countertop then complements the nuance of the room very well. Woody elements dominate the decor of this Boho dining room which makes it look and feel so inviting. The wood flooring in chevron pattern gives a catchy decorative touch while also keeps the earthy character of the room. Then, those decor items in chrome finish glamorize the nuance of the decor. An accent wall which is covered with greyish slates complement the dining chairs and rug in this Boho dining room elegantly. 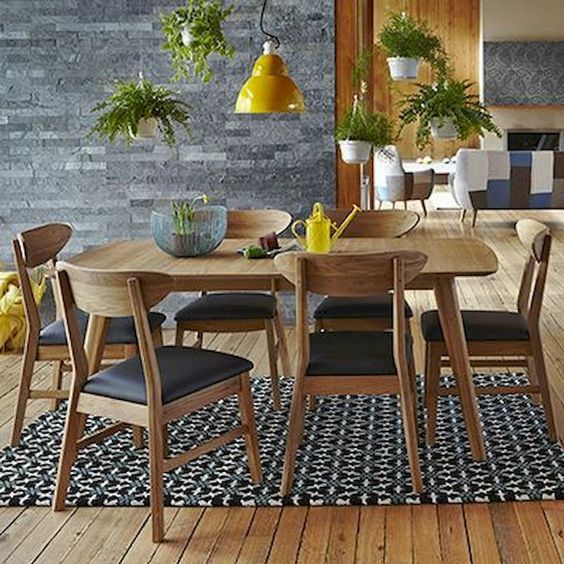 The wood finishes of the dining set and flooring then add an earthy atmosphere alongside those indoor plants. 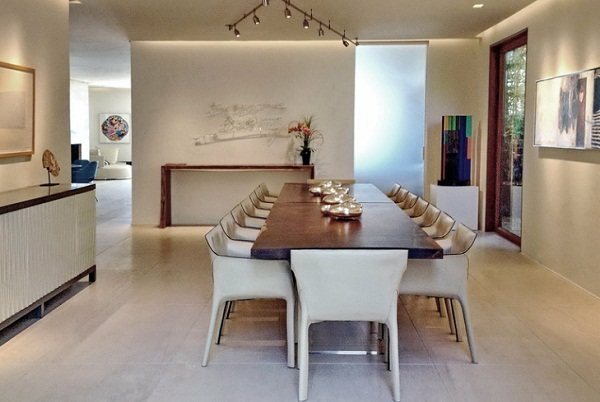 Basically, this one is an all-white Boho dining room in which the floor, ceiling, and walls are colorized in white. Even more, some pieces of furniture and appliances also come in white finish. 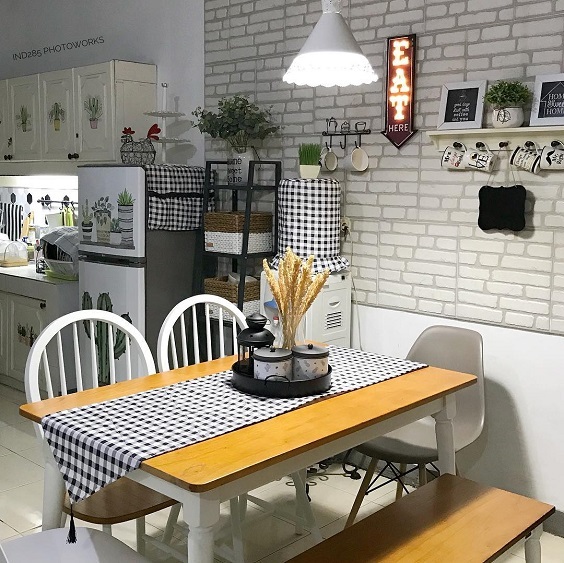 To make it look more attractive, the 3D white brick wallpaper decorates one side of the wall and wood finish adds a vibrant earthy color to its decor. A pretty living room with white and pink floral wallpaper for you who love a feminine decor. To keep the brightness of the room, almost all pieces of furniture, appliances, and decor items are chosen. Then, natural wood tone and indoor plants colorize the decor in a very beautiful way. 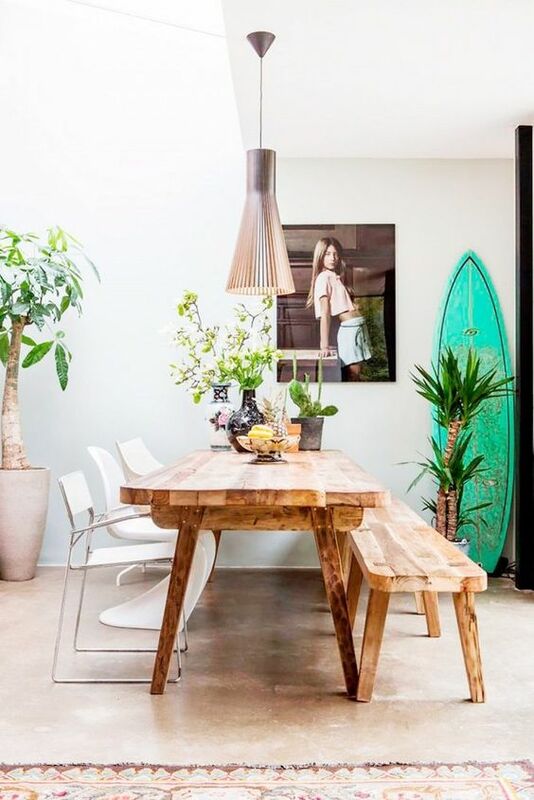 A chic Boho dining room idea which is a good option for you who have a limited space. 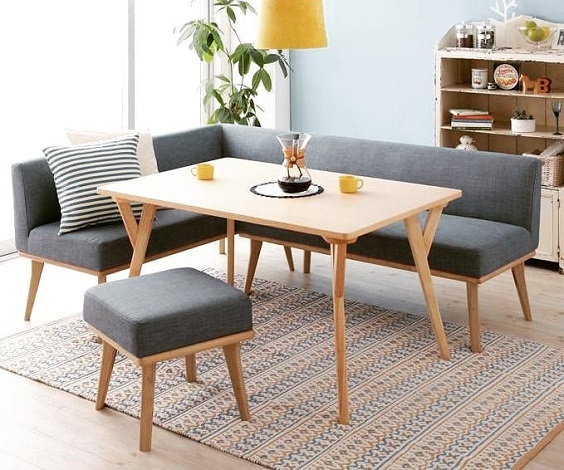 Here, a 3-piece picnic style dining table is used as the main dining area which also works as the focal point. The neutral color dominates the room to create a brighter overall look and wider impression. 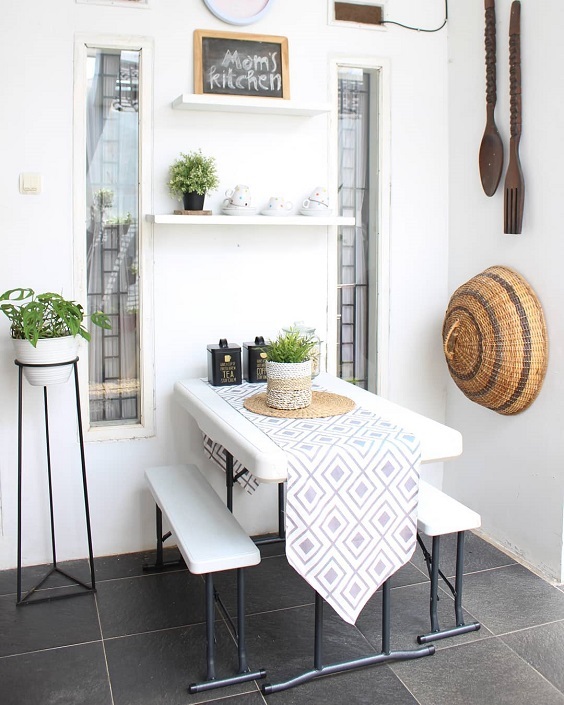 This dining room is built close to the backyard which makes it feel so joyful. 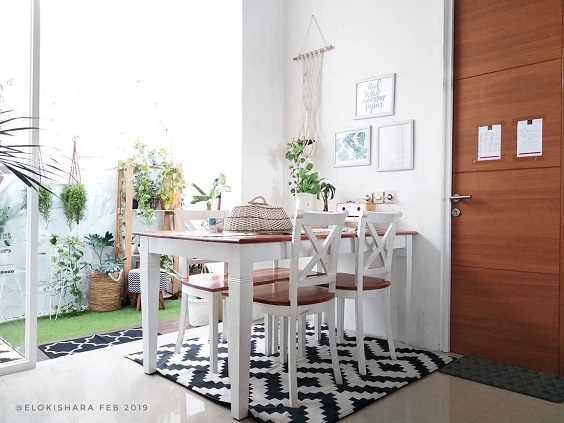 The decor of the room looks stylish enough with the combination of white, black, and wood tones. 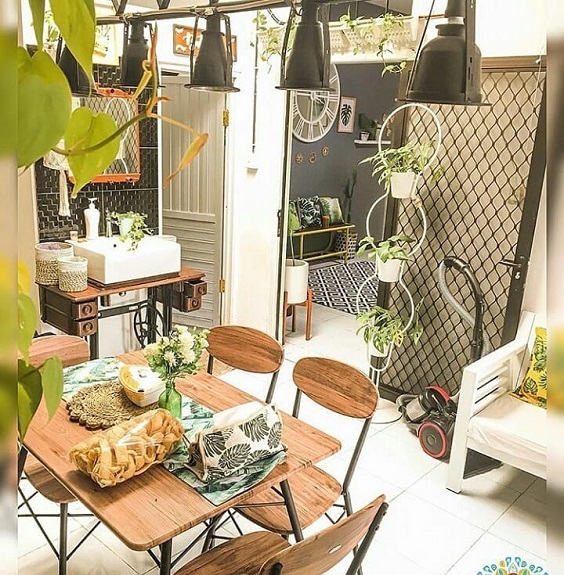 The backyard is also decorated in Boho style which create a harmonious overall look of those two different areas. 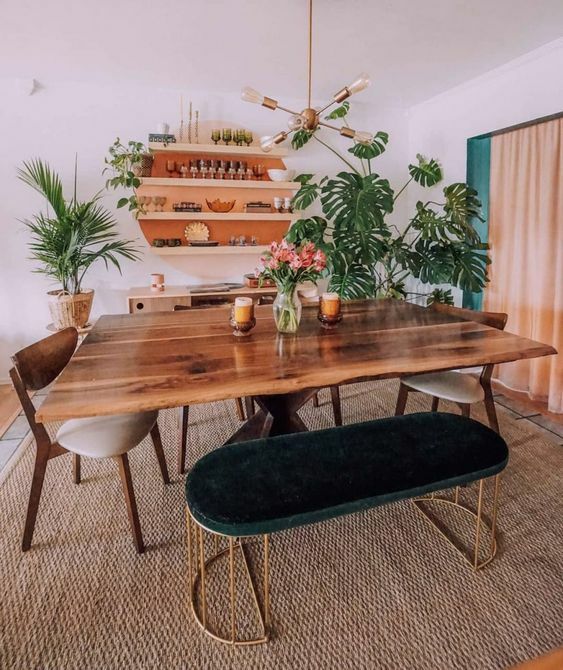 A very attractive Boho dining room which is filled with tons of earthy elements that you can add to your inspiration list right away. Wood tones and various kinds of indoor plants dominate the decor which create a distinctively beautiful overall look. 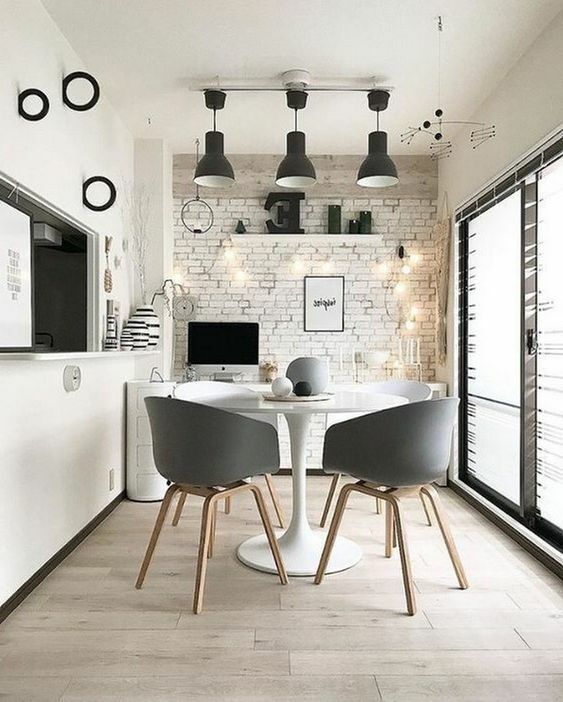 The sleek dining set in rustic and monochrome finish gives a chic modern to this Boho dining room with warm grey main color. Then, an ethnic rug in monochrome style enhance the attractiveness of the room and also adds another style uniquely. Those dining chairs in black finish look so elegant among the wood elements which dominate the room. To neutralize the decor, white colorizes the walls and ceiling which also creates a simple bright overall look. 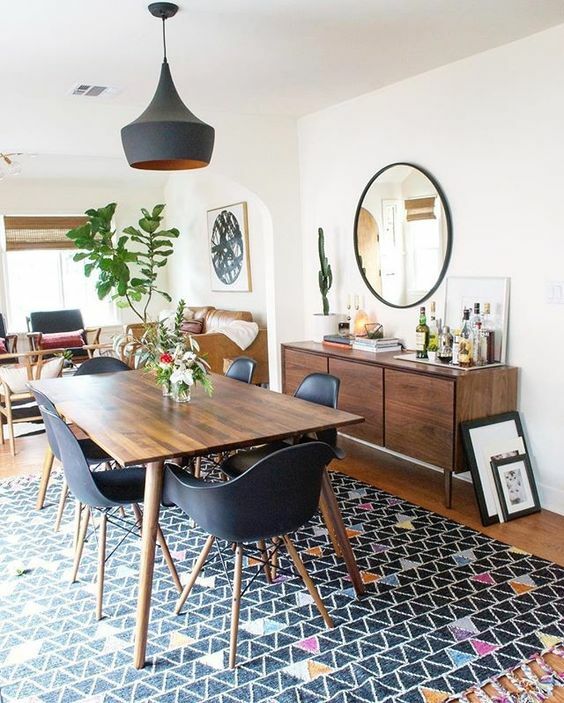 An area rug with catchy geometric pattern in elegant colorful look styles up this Boho dining room in a very attractive way. 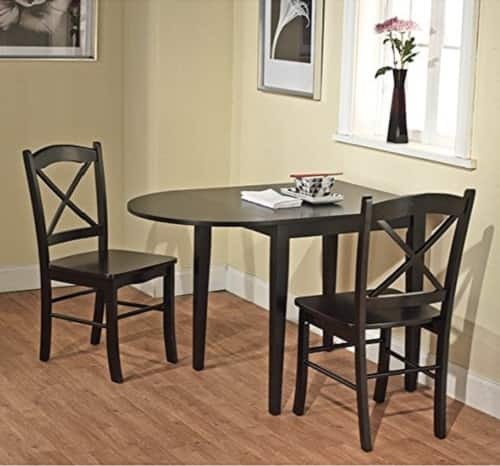 A 7-piece dining set with black and rustic design complements the nuance of the decor beautifully. Navy is always one of the most stylish shades that will never fail to decorate your home. Here, the shade colorizes the wall while the wood tones from those furniture and flooring complement it. The room has a very fabulous contrast that everyone will adore. The wall in natural concrete finish with the worn texture and wood plank flooring in white finish create a unique rustic nuance with a more modern vibe. 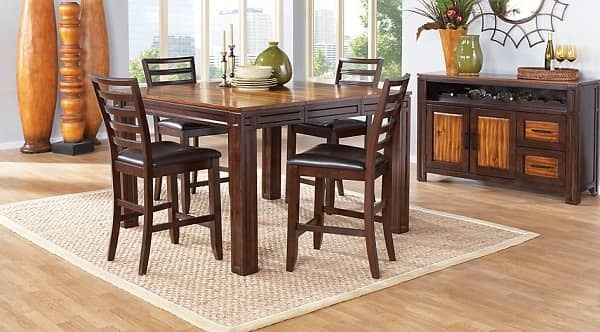 The dining set in distressed monochrome and wood finish harmonizes all the elements of the room stylishly. Then, some huge indoor plants add a more colorful touch in a natural way. 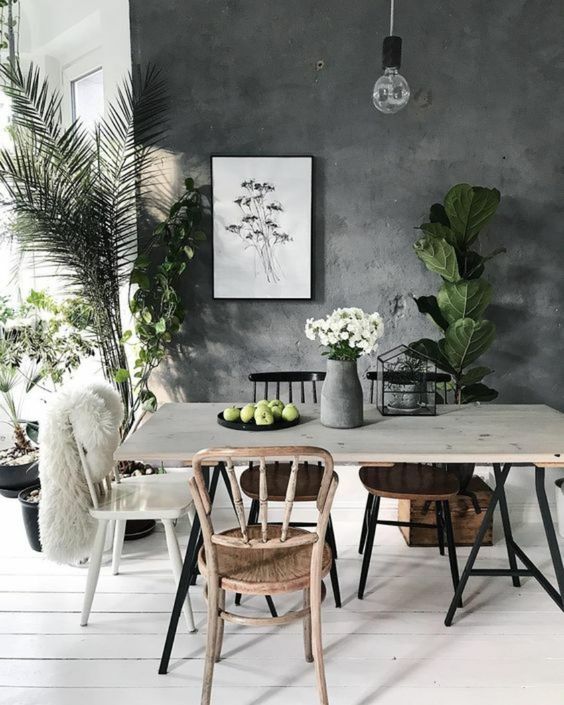 The wall and flooring of this Boho dining room is finished in natural concrete look which creates a distinctive grey nuance. 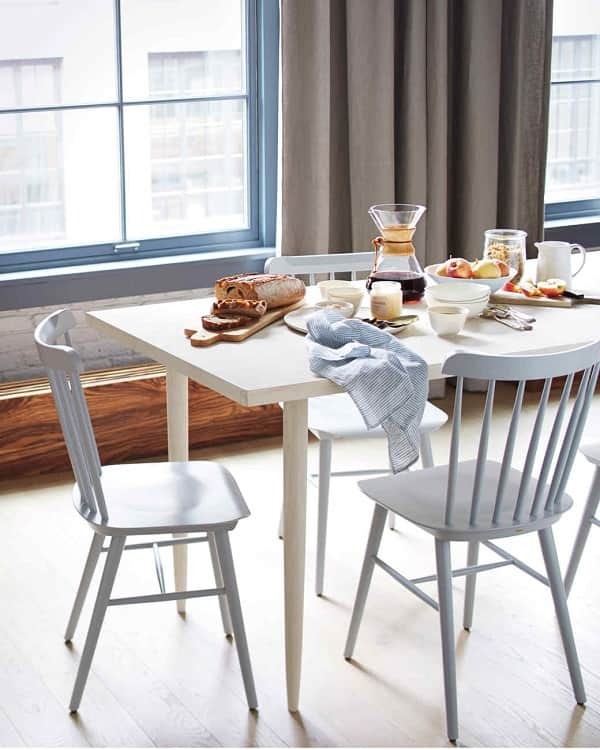 A small 4-piece dining set with grey chairs complement its greyish nuance gorgeously. Moreover, some earthy tones create a more attractive look around the room. 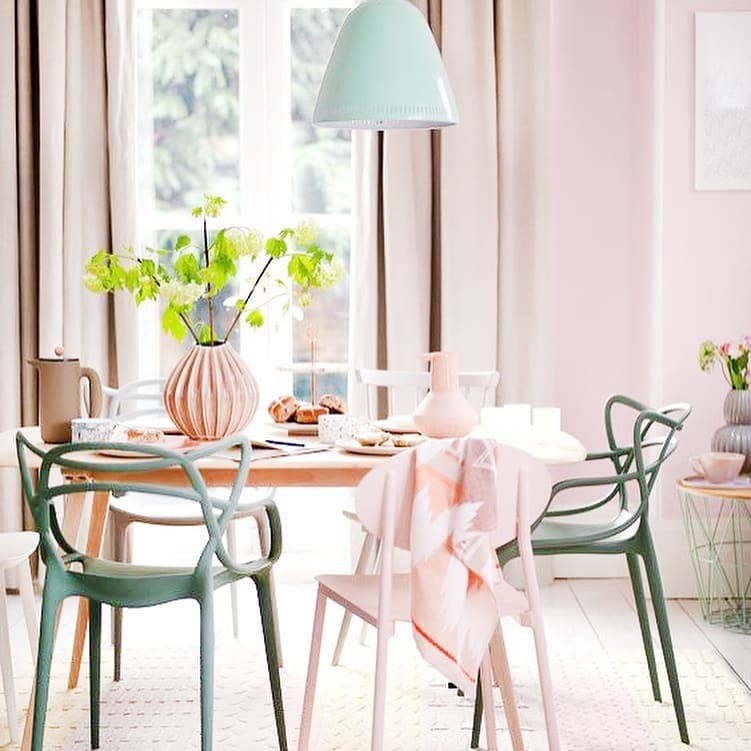 Another inspiring Boho dining room with a pinkish overall look which is so worth to add to your inspiration list. 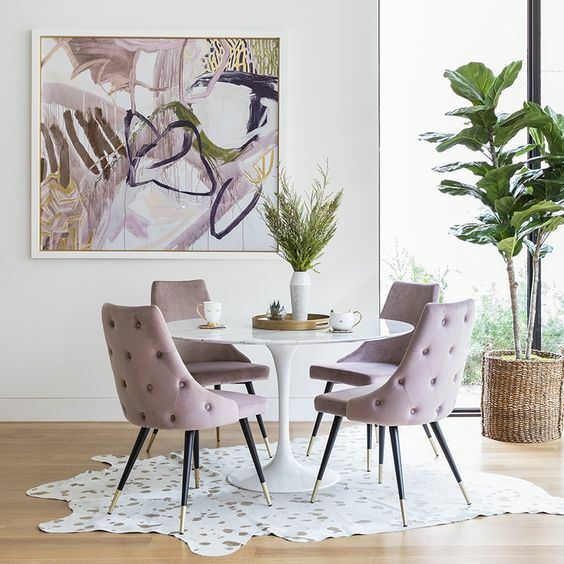 The room is dominated by white and soft wood tones while those pink dining chairs and wall art give another chic color touch to the decor. 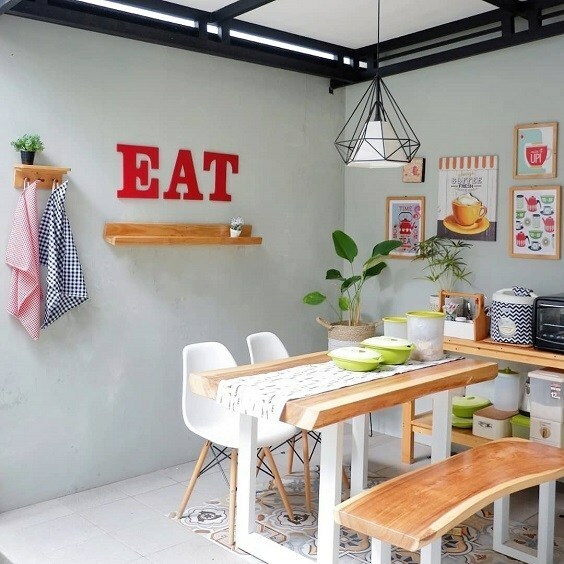 For you who love simple dining room yet with a more colorful decor, this idea can be a good reference for you. 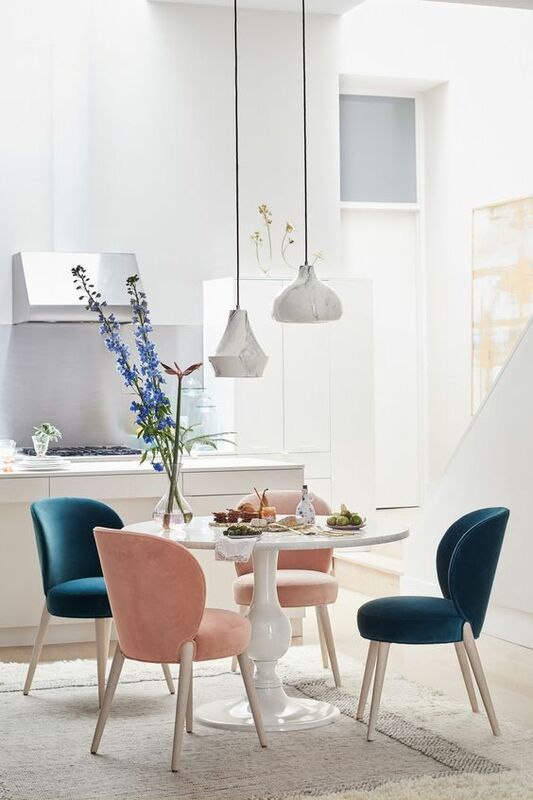 Teal and pink velvet dining chairs definitely become the main attention grabber inside this Boho dining room which is dominated by white. Its white marble dining table and jute and wool rug give a nice texture to the decor. A beautiful dining room with unique rustic decor which is so tempting to copy. One corner of the room is decorated with a white exposed brick look and wood board which gives a stylish rustic vibe around. Then, the various styles of furniture and lighting fixtures give an eclectic style which even makes the decor look way more enchanting. So those are some inspiring Boho dining room ideas that you can use as the ultimate reference when you have a plan to decorate or redecorate your own dining room. They are designed attractively with a very joyful vibe that makes the worth to be your main inspiration. Choosing Boho decorating style to decorate your dining room is absolutely a good idea to keep in mind. 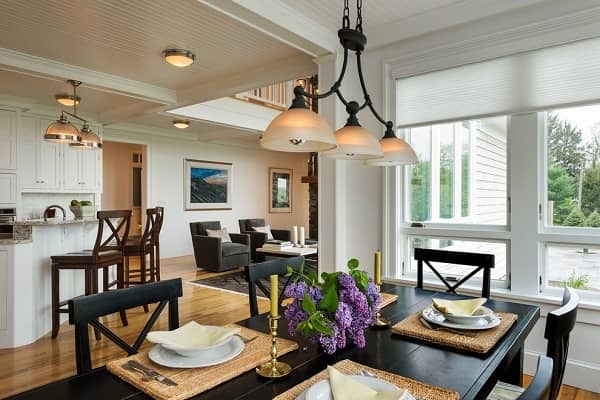 You will have a distinctively beautiful dining room which will be adored by everyone. Just pick the best Boho dining room idea which suits your needs and taste now!